West End Target the Tour Training, is a new ride for all cyclists who have enjoyed the Ardrossan TtT but are looking for rides closer to home. 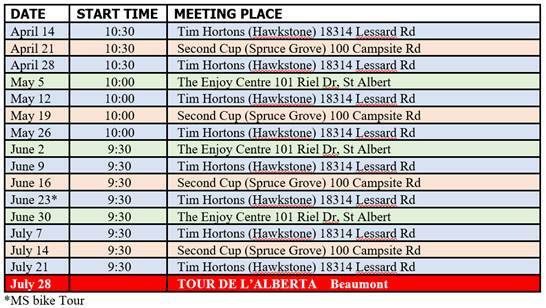 The West End TtT has various starting points anywhere between the west end of Edmonton, Spruce Grove, Devon and Villeneuve, so make sure you keep an eye on the website. These Sunday morning rides enables riders to prepare for the Tour de l’Alberta or other longer rides (or just get into good cycling fitness condition). It is a progressive ride that builds rider endurance. A focus of each ride will be safe riding. Bring your well-maintained road bike and cell phone for an enjoyable tour on good roads with some rolling hills. Beginner to intermediate riders welcome! There will be a sweep and maps provided. e-newsletter each week. Please arrive 15 minutes ahead of trip departure for important trip information. Hi. I just joined the club. Do I have to sign up for these rides? I don’t see a way to do that. This will be my first event. No need to sign up at all. Just arrive early with your bike, helmet and anything you will need on the ride, sign in with the ride leaders and you’re good to go!